A studio apartment is a living space that combines a living room, bedroom, and kitchen into a single room. Studio apartments only contain two rooms (the main room and bathroom), and they’re usually very small by design. Studios are a very popular living option for all kinds of people, but their size can be frustrating. Emphasis on can. Living in a studio apartment doesn’t have to be frustrating. If you can learn to maximize your living space, you can live in your studio comfortably and effectively. You’ll probably become a lot more organized and efficient in the process, to boot! 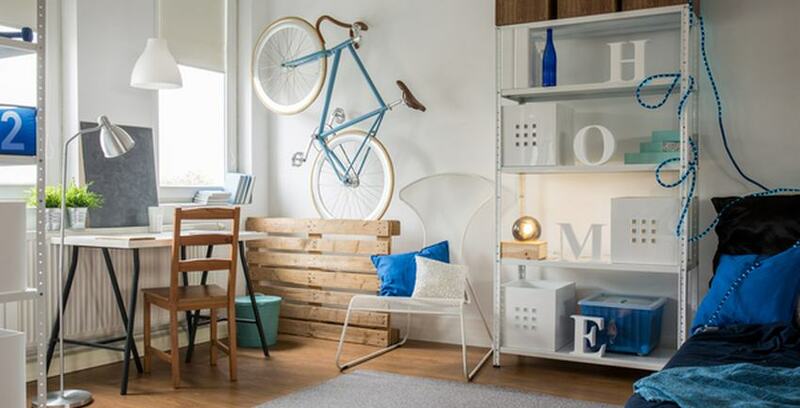 Here are our four top tips for making the most of your studio apartment. If you can follow all of these, you’ll be living comfortably with space to spare in no time. Invest in furniture that has more than one purpose. When it comes living in any small space, the name of the game is living purposefully. To really make the most of limited space, everything you keep in that space should have a valuable function. When you can find items that have more than one valuable function, you’ve hit the jackpot. All kinds of furniture fits this description. You could have an ottoman that doubles as storage, a desk that doubles as a bookshelf, or more. Think of ways to fulfill as many functions as possible with as few pieces of furniture as possible. You should try to be very careful about bringing new stuff into your apartment. Clutter can grow surprisingly quickly and easily, and you may find yourself overwhelmed quickly. To combat “clutter creep” you should take inventory of your stuff on a regular basis. If you want to, you could even go full KonMari method on it. Pick up each item and ask yourself if it brings you joy. If it doesn’t, get it out of there! There are all kinds of ways you could get rid of clutter you don’t want any more. Goodwill and other charitable organizations will take a lot of stuff for donation. You can donate clothing, furniture, books, media and media devices, and more quite easily. If there’s stuff you need to move but can’t give away, you could always use a storage unit. Lots of people use storage units for storing valuables or keepsakes that they have no room for at home. Hang mirrors to help create the illusion of more space. Any type of reflective surface can help add height and width to a small space. If you want your studio to feel bigger, hanging a few mirrors can make a big difference. Go for furniture that is as open as possible. Open furniture that is airy and light can help to expand small spaces. It’s also easier to navigate around. Open furniture is especially helpful in studio apartments that don’t have much closet space. Open shelving and storage can help you organize because you always actually see all your stuff. When you look at your stuff everyday, you’ll think about it more often, which ultimately means you’ll organize it more often. Studio apartments are often small, but that doesn’t mean they have to feel restrictive. If you follow these tips, you may find you can keep everything you want in your space without compromising. Remember: it’s all about knowing what you really want. When you figure out what you want your space to look like, you’ll have everything you need to make it happen. If you decide you need some storage space while you’re assessing your studio space, Storage Direct has you covered. We offer a wide variety of storage units to suit any need you could have. Whether you’re throwing a few keepsakes in a box or moving furniture, we’re happy to help.